Never in my life have I met a character like Kippy Bushman. And never in my life have I ever related more and found humor in the awkward behavior as in this book. Kippy Bushman, if she were an animal, would definitely be my spirit animal, okay? Many books have tried and failed to accomplish the awkward trope, making the character more cute than awkward, which has always bothered me. Like, no one barely reacts to something awkward that a character does, and if that character were me, I would have been given hell over it. Kippy was absolutely awkward it was perfect. And I totally got it, too. And she was so determined, too, in everything that she did. She definitely wasn't a dull character. I can't tell you the last time I read a murder mystery novel. It certainly has been a while. Usually, you don't see teenagers gallivanting around town as they try to pick up clues, because let's face it, teenagers aren't going to be the ones to solve murders or be taken seriously. So, obviously, it's not a realistic genre for YA. However, with a strange balance brought to you by the author, the whole clue-searching thing didn't seem all too far fetched. I was pretty much hooked right from where Kippy accidentally puts salt instead of sugar in cookies meant for the reception after her best friend's funeral. Right from there I knew that I would absolutely enjoy this novel. And not all of Kippy's story is light, fluffy, and awkward. There's a lot of emotions and darkness. A lot of the characters are pretty messed up. Kippy's still emotionally unstable from her mother's death, Davey Bushman, Ruth's older brother, has PTSD, and being that they're not the norm is this small town, they've almost been exiled. And it's fascinating to see all the dynamic of it all. I was definitely kept guessing throughout the novel. I became wrapped up in Kippy's emotional tale and along with the dark humor, this novel easily became one of my favorites of the year. 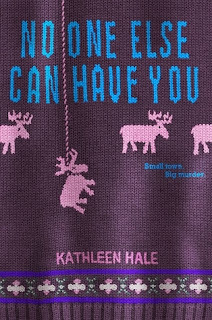 Kathleen Hale is a debut author, and while her first book doesn't come out until January 7th, I'm hungering for other works by her. Oohhh, now I'm curious to read it! I love awkward characters because I, too, am awkward. I love it when there's darkness in the characters! It makes them more realistic. I hate stories that are all fluffy bunnies and happy unicorns. Life isn't like that! Now you've got me interested, think I may have to go back and download it!